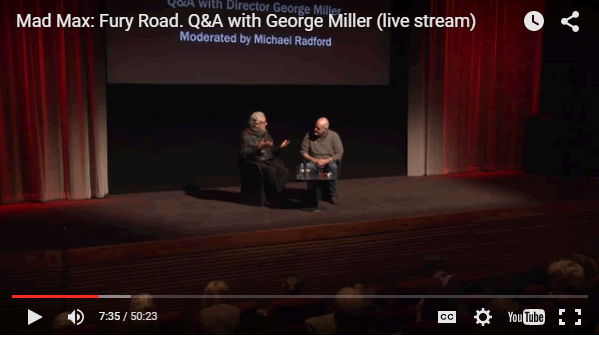 One of the last things I was involved with before I left Opera North was a live-streaming project called Inside Opera: Live (more info about that here http://www.theguardian.com/music/2014/may/05/inside-opera-live-stream-youtube), and one of the first things I was asked about when I started at Directors UK was whether or not we should live-stream our AGM/conference. It’d be fair to say that live-streaming is still very much ‘a thing’. But I’m not always entirely sure why it is so widespread (or at least the desire for it seems to be). I think typically what people are describing when they talk about a ‘live stream’ is a live video and audio feed of an event, although it is always a bit disappointing when you realise that is the sum of their ambition. I am firmly of the belief that there are loads of different ways you can represent/showcase your event/performance/discussion/whatever in close to real-time in a way that’s meaningful for people who can’t physically be there. Quite often this wouldn’t involve a video OR audio feed, and everyone would be much better off for it. I think the main problem with the rush towards live-streaming every single thing that happens is that to do live-streaming well requires a level of technical and logistical expertise that is not a) widely available or b) cheap. You can, of course, get up and running with a live-stream using nothing more than your phone and a free wi-fi connection (although I personally wouldn’t ever watch something like that) but to do it well requires a not-insignificant amount of equipment and people. You also have to question why people are seemingly so keen to live-stream whatever it might be they’re keen about live-streaming. Is there really an audience out there who can’t get to the event and who want to sit at (most likely) a computer for an hour or more and watch the thing unfold in real time? Really? I mean, really? Have you done that? Do you know anyone who has done that? Would those people be just as happy watching an edited video of the event a few days later? I don’t really have a definitive answer to that and of course it’ll depend on the specifics of what you’re wanting to live-stream but my instinct is that most people probably won’t get much less out of watching the latter. I am also surprised at how often people live-stream something and then you never see or hear anything from it after the day of the event, I know there are sometimes issues with rights etc but if you’ve gone to the effort and expense of having cameras at the thing do you not want to capture it for posterity? Surely you believe there is some value in what you’re doing or you wouldn’t have live-streamed it in the first place! And more people are likely to watch something that is available for them to watch whenever they want to. Of course sometimes it is completely valid to want to live-stream something, especially if it is an interactive thing and you are offering some way for those watching the live-stream to engage with the event – even though they’re not physically present. Or if the thing you are live-streaming is something of an ‘event’ and there really is a ‘must-view’ aspect to it that would totally be lost if you don’t watch it unfold in realtime (although, be honest with yourself, how many things really fall into this category?). People frequently comment on their surprise when they discover the cost of live-streaming something ‘properly’ (and I’m not even talking about live-broadcast into cinema a la NT:Live or similar which involve OB trucks and all sorts of incredibly expensive gubbins). But once you start to break it down it is, maybe, less surprising. If you were live-streaming, say, a panel discussion you might want to consider: at least a couple of cameras (and probably accompanying camera operators), audio feed (which would at the very least require a decent feed from the venue’s pa), someone to direct the thing and vision mix between the camera feeds, some way for the director to talk to the camera operators so they got the shots they wants, maybe some basic lighting, all of the switchers, cabling and whatnot that’d connect all of this together. In addition you’d want some way of getting your audio and video online and out of the venue, this would ideally require a good internet connection and a decent computer. You’d really like to have someone worrying about the technical side of things too, you might want someone monitoring social media, and suddenly you’ve got a fairly big pile of people and cameras and cables and all you’re really doing is filming in a pretty controlled environment where nothing particularly exciting is really likely to go wrong. I DO think there is something to be said for the view that in creating a live-stream you are creating an entirely new experience. It is fruitless to try and merely think of it as a ‘relay’ or extension of the live experience that you are covering, you are actually reinterpreting that performance/whatever, for a new audience, who are experiencing it in an entirely different way to the audience in the same physical space. You are directing that experience and you could shape something that is wildly different to what physically-present audience experiences. There is clearly a hugely interesting discussion to be had about the potential creative implications of that, although there doesn’t seem to be a massive debate on those terms just yet (or maybe I’m simply unaware of it). I was thinking the other day and I don’t think I’ve ever really watched a live-stream of anything so I’m probably not the target market which may account for my scepticism. Equally it may come from the fact I’ve seen this sort of thing discussed ad nauseum over the last few years so I am just completely bored of hearing about it. I also have some sense of the time, money and hassle involved in organising a live-stream (it could conceivably be more difficult and expensive to sort out than the event it is covering). I’d be interested to hear from any live-streaming devotees. I am not one of you.